The AGeary swift plays both roll of swift and skein winder in an easily transportable and collapsible construction. 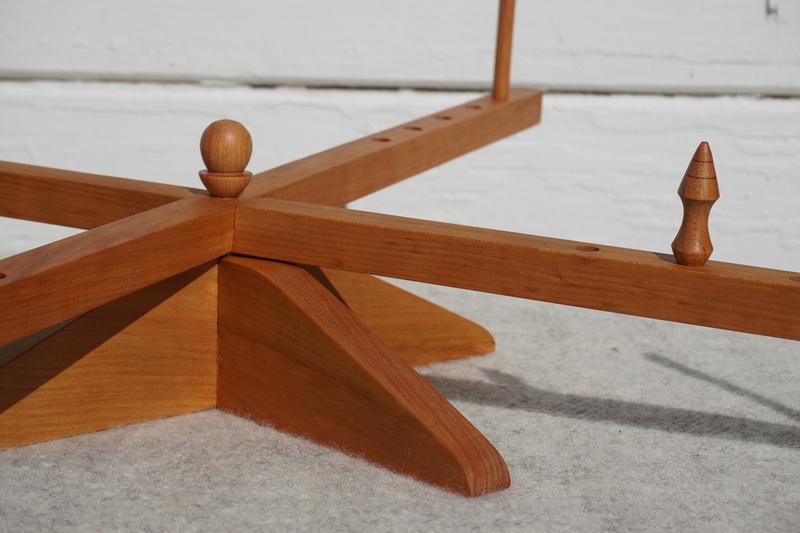 Primarily used in conjunction with ball winders or nostepinnes, this swift speedily and efficiently secures a skein of yarn and freely rotates as you wind. 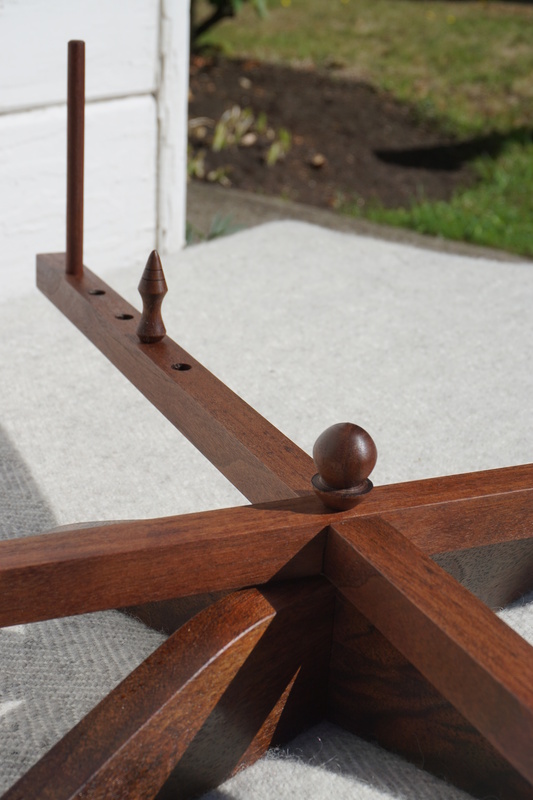 AGeary swifts have been designed to accurately wind yarn, depending on where you place the provided four pegs, each rotation will equate to two yards, one and a half yards, or one yard. This measuring feature is very useful for measuring out yardage requirements. 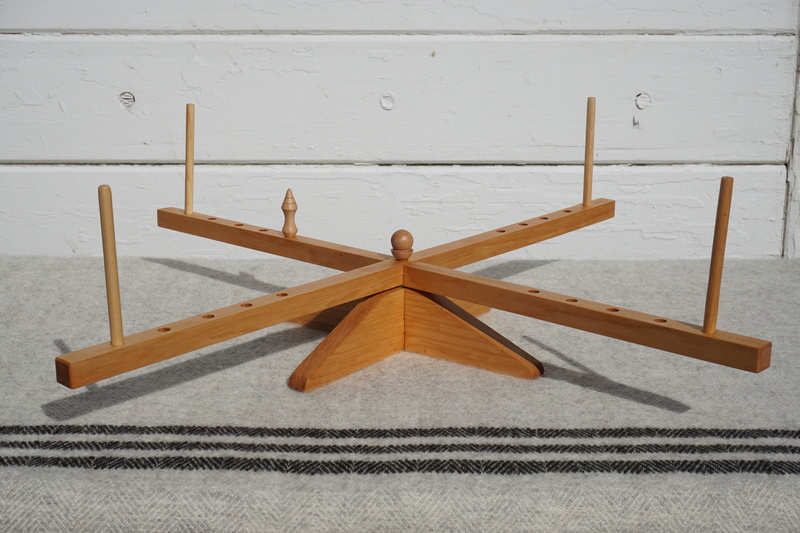 If you spin or dye your own yarn, this all in one tool is perfect for many of the steps required in preparing yarn for projects! I currently offer swifts in two woods: cherry and walnut. Each swift is equipped with hand turned elements and has been individually tested. Swifts, like all of AGeary products, are finished with a classic wood finish: boiled linseed oil, poly urethane and mineral spirits. Linseed oil penetrates, poly urethane creates a durable film, and mineral spirits flashes off. Once the finish is cured, they are waxed for extra protection and glow. I purchased your beautiful swift this weekend and have used it three times already. I appreciate your impeccable workmanship at such an affordable price. It is a treat to take it out of it’s muslin storage bag, to inhale the linseed oil and to fit it together, while admiring the turned pieces. It turns like a dream. A versatile work of art. I am so glad you like it! Thank you for your warm words.